BETT – London, England – Jan. 25, 2017 – Soundtrap, the online collaborative music and podcast recording studio, is expanding its participation in Google for Education’s “Creative Apps for Chromebooks” program to include the UK and Nordics. Soundtrap, from Sweden, which launched to the public in early 2015, rolled out an education version of its audio recording platform one year later, with a predominant focus on the US, Europe and Australia. Since then, more than 200 new schools each week embrace Soundtrap as a preferred educational tool in their classrooms. Moreover, Soundtrap has now more than one million users worldwide. At BETT, Soundtrap will showcase the many advantages of its education technology, including its ease of use and versatility across devices. Soundtrap is accessible to almost every device user because it works across iOS, Android, Chromebook, Linux, Mac and Windows platforms, making it ideally suited for project-based learning and collaborative assignments. All projects are saved in the cloud in a safe, protected environment, which means they can be accessed at any time, from any device. This makes Soundtrap especially suited to the classroom. (See video: https://youtu.be/2ViLQD_2RK4) Soundtrap was nominated as a finalist for the BETT Awards 2016 for best International Digital Education Resource. Also included in the Creative Apps for Chromebooks are WeVideo and Explain Everything. They are available from Chromebook reseller partners with special pricing when all three apps are purchased together. 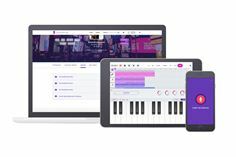 Soundtrap for Education is also available separately through https://soundtrap.com/edu where discounted pricing for schools is offered at less than £4 per seat per year. Soundtrap will showcase its solution at the BETT (British Education and Training Technology) London conference, Jan 25-28 at booth #C482. Soundtrap is the first cloud-based audio recording platform to work across iOS, Android, Chromebook, Mac and Windows platforms, enabling users to co-create music anywhere in the world. Headquartered in Stockholm, Sweden, the company also has an office in Silicon Valley, California, US. Soundtrap provides an easy-to-use music and audio creation platform for all levels of musical interest and abilities, and is being used by the K-12 through higher-education markets. For more information, visit: http://www.soundtrap.com/.